Minus four and a half today! Haven't seen that in a long while. The bottom drawer temperature did allow one or two 'pretty' pictures to be taken though, before a hurried retreat to the warmth of the mess coach was preferred. The signal box roof looks done. Very neat; and the scaffolding is gone too. The STOP board is still there; perhaps it refers now to the big hole in the track further along (cough). We should fill that again on Saturday. 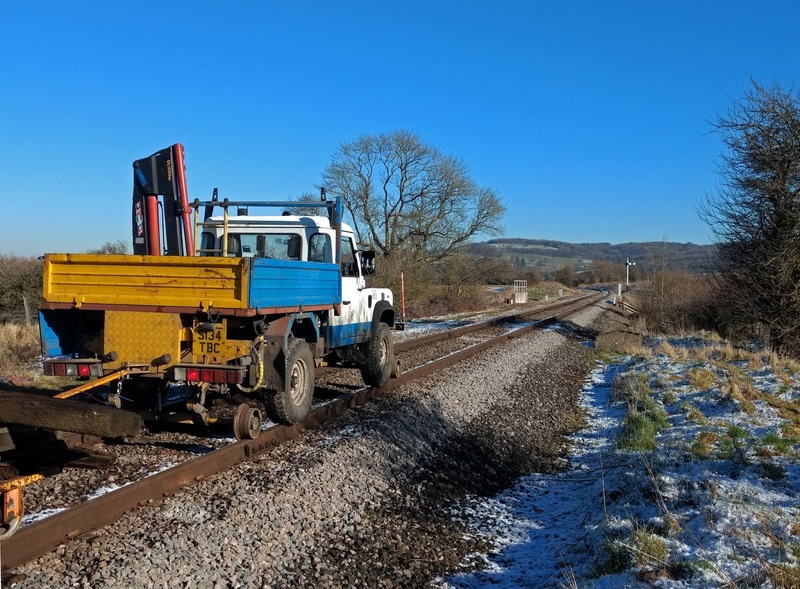 Steve is back at work, digging an urgent trench for a water pipe at Broadway, and hence the planned ballasting today was cancelled. We shall find another day for it. We love creating replica heritage assets and it's great to see other people at it as well, but a tiny niggle here: The size of this building is not convincing for what the sign says. After our tea and briefing we split into two gangs. One went to Broadway to attend to the clearing of excess ballast of two turnouts, while the other went to Winchcombe to sort out the yard, which meant several smaller jobs, all interesting. On our way, we were asked to take this TB2 or nut runner with us in the Landie. It was diesel powered and very heavy. 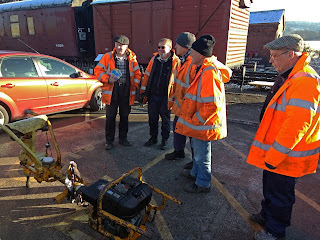 No crane was available, and the picture shows the moment the gang are contemplating what to do next. In fact, anything but lift it up by hand. 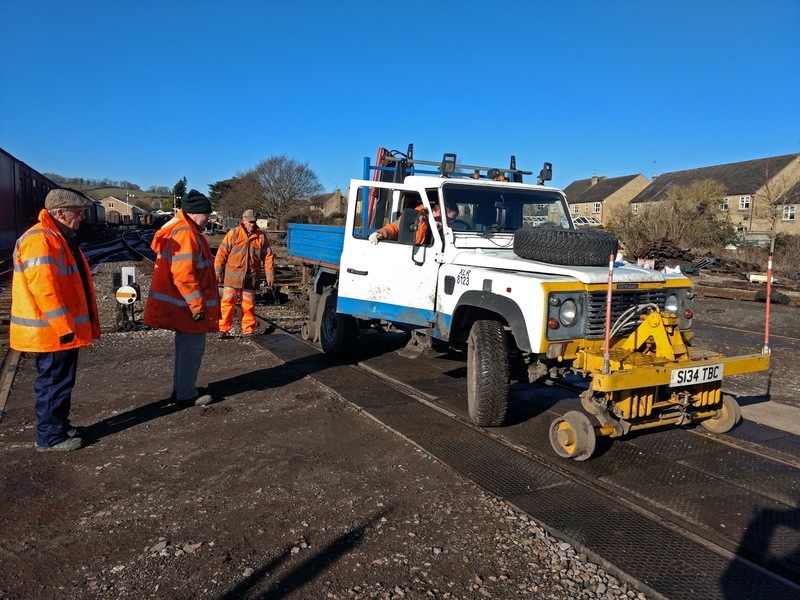 Arriving at Winchcombe, one TB2 loaded on the back by hand, we found that the new roadway up the yard was almost done. A new panel had just been poured and was covered in straw, and there are two more to go. Isn't it odd that this lovely new road goes exactly up to the front door of C&W? Do they have connections? At the other end there was lifting capacity available in the form of the Telehandler. The non-starting TB2 was taken care of by Jonathan and Clive, and after a trip to C&W with a begging bowl they came back with a welded repair and managed to start it successfully. Cooperation has worked once again. The next job was to get the Landie on to its rail wheels so that it could pull a Permaquip trolley. This happens fairly rarely, in fact it's only the second time in 6 years your blogger has seen it done, so enjoy. The back goes on first, then the front, as that is manoeuverable - see the front wheel turning in. Here is the full 'train', ready to roll. The road wheels stay on the rails to provide the propulsion, while the rail wheels provide the direction. 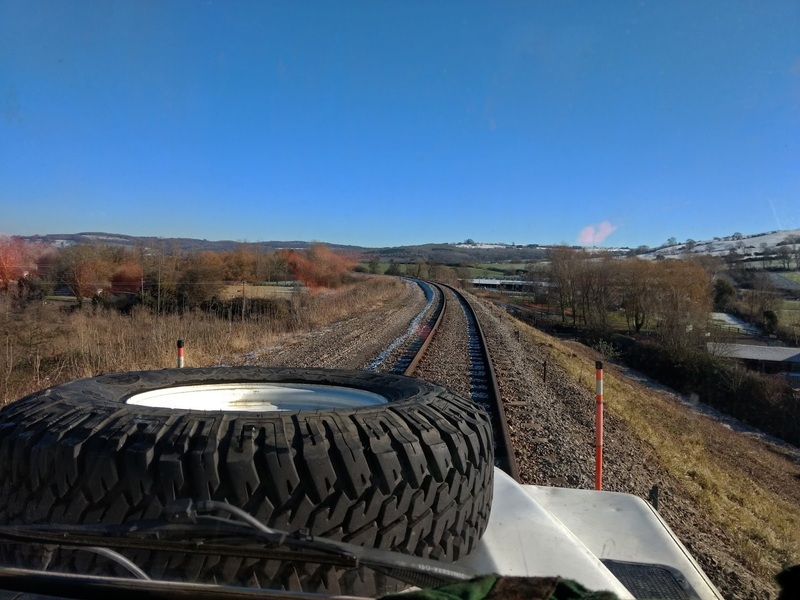 That's your blogger on his first ever driving turn on the GWSR. Too busy to look though. The steering wheel is locked, but we still got round Chicken Curve. That's the wonder of science for you. Going along, you can take both hands off the wheel, and even play with your camera phone, and it's completely legal! We trundled along at a respectful 10mph, those rail wheels are tiny. Here we are at a service stop just south of Hayles Abbey halt. It was beautiful with all the white snow and the blue sky. 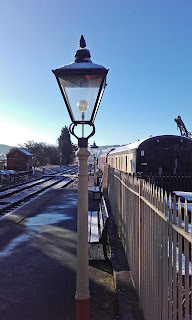 Eventually we got back to Winchcombe, where we stopped by the inner home signal, just like a proper train. 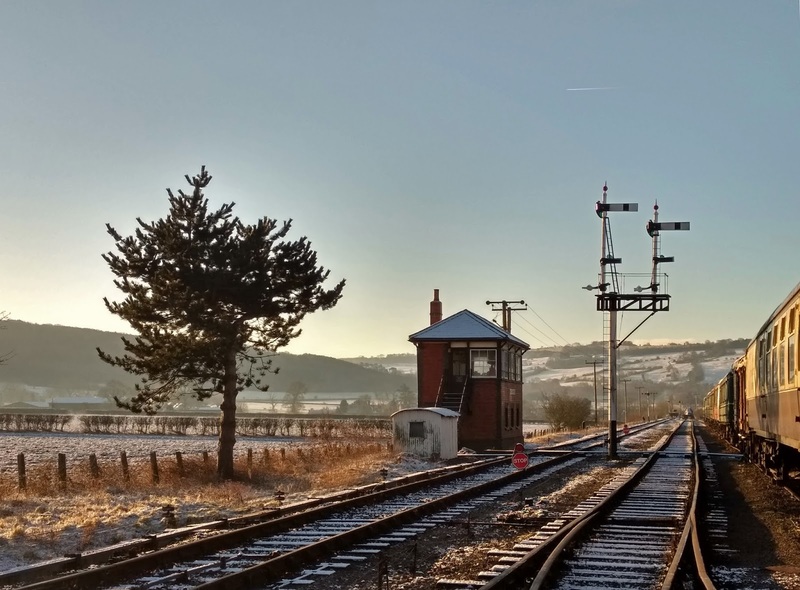 When, oh when, will that signalman wake up? Should we be obeying Rule 55? Does a phone call count? Not if it's to his mother. 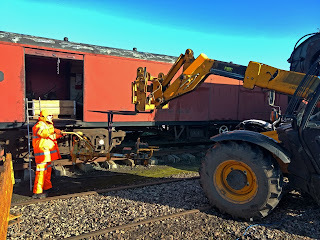 We tidied up the yard and moved a lot of Broadway imperials over to the other side, as they had been unloaded in the middle of the PWay yard area. After the tidy up, a smaller gang started to dismantle the temporary storage siding on the other side of the yard. The vehicles that stood here have been removed by their owner to a new location. More vehicles are to follow - see the background. 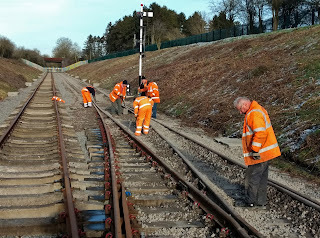 It was observed that these (unconnected) sidings were placed there by the nascent Wednesday gang as one of their first ever jobs as a new mid-week gang, many years ago. All this area has to be cleared, as we now plan to use it for more permanent yard development. These crowd barriers were placed by the GWR in front of their ticket hatches to regulate the flow of customers. These carved wooden tops sat between two beautiful cast iron posts, about waist high, installed 30ins away from the ticket hatches. We couldn't believe our luck at Broadway when we found two originals burried in the demolition rubble about the site. They were carefully dug out of the mud, shotblasted and powder coated, and now await installation once the booking hall floor is finished. Two more posts were cast using a perfect example (i.e. one that had not been buried in clay for 50 years), lent to us by a friendly neighbouring railway - thank you Mick ! At Broadway, the other gang had finished one turnout and was digging out the second. 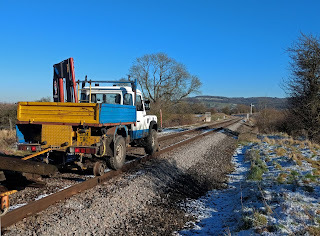 Two van loads of surplus materials were gathered up from the lineside, and also returned to HQ at Winchcombe. We like to leave a neat site. 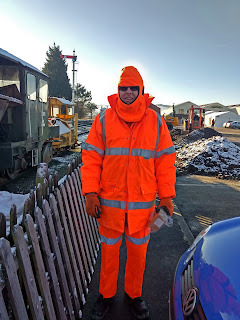 This digging out was very tiring, especially in the morning, when the ballast was still frozen. The sunny areas mostly melted and allowed the job to proceed, but in the shadows the ground remained hard and frozen. On the way back through the station we cast a glance into the Gents. The sanitaryware has arrived. It is being installed by volunteers from B&S department, another case of good cooperation. More of them were laying slabs outside; you will see this work in their own blog in due course. Just look at these Edwardian style wash basins. Aren't they fabulous ! 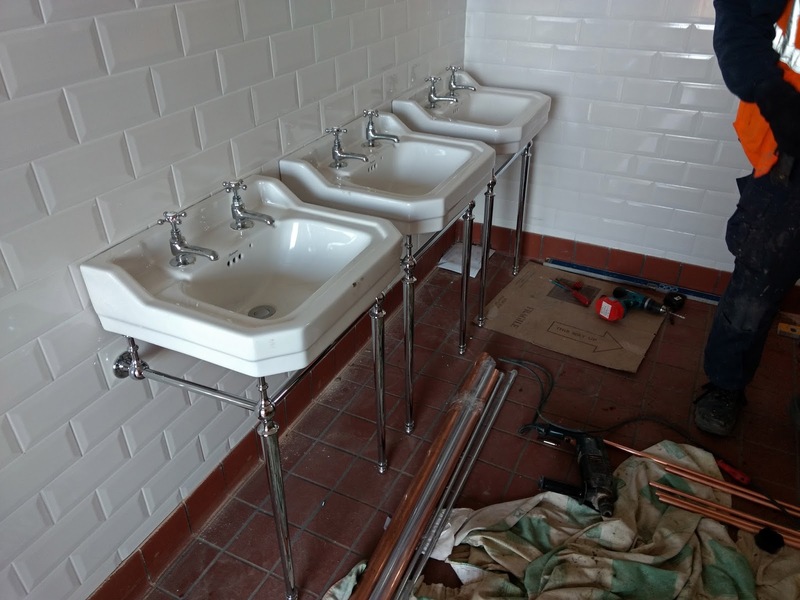 I wonder if there's going to be "stall" type urinals in keeping with the Edwardian sinks? And maybe cast iron high level WC cisterns and chain pulls?!!! Stall type urinals ('Niagara') were used at CRC, and the bottoms of them are still visible. You can still get them too. Their use at Broadway would be nice, but there are technical issues. Toilet cisterns will be low level, also for technical reasons. The shape though will be old fashioned 'corner cut'. I feel like this would be more suitable at CRC should the P2 waiting room ever be recreated; that way folk have got the choice of "heritage" or "nice" toilets! It's not a full report without piktures of the cakes! Many thanks for the update again. 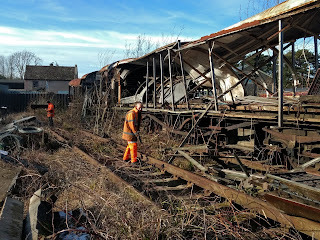 The 2 collapsed GWR coaches in the temporary sidings at Winchcombe yard look really bad now. They are, I understand, the only "surviving" examples of their type. Only the underframes would be any use now I guess. Living proof that not everything that is saved can be saved, so to speak. Wonderful pictures Jo. Typical of BR to put the parcel station in the middle of nowhere! It must be hard when the weather interferes with planned work. Hopefully the weather will improve for the weekend to enable you to catch up as the open season gets closer. When is the ballast regulator and tamper machines due on the line and will there be pictures/video? 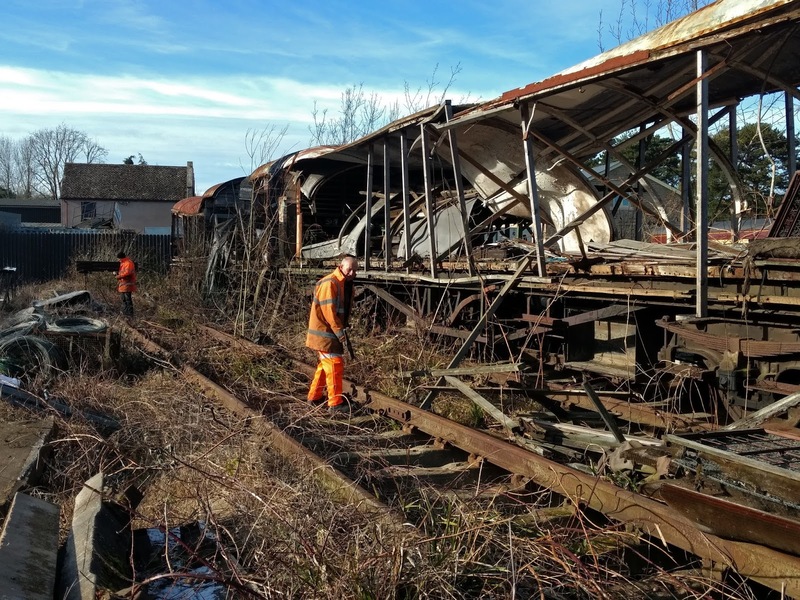 Also will the old coaches be removed from the sidings and will they have any useful "spares" that C&W can use? So keep warm team well done for going out in the cold, thanks for your efforts. 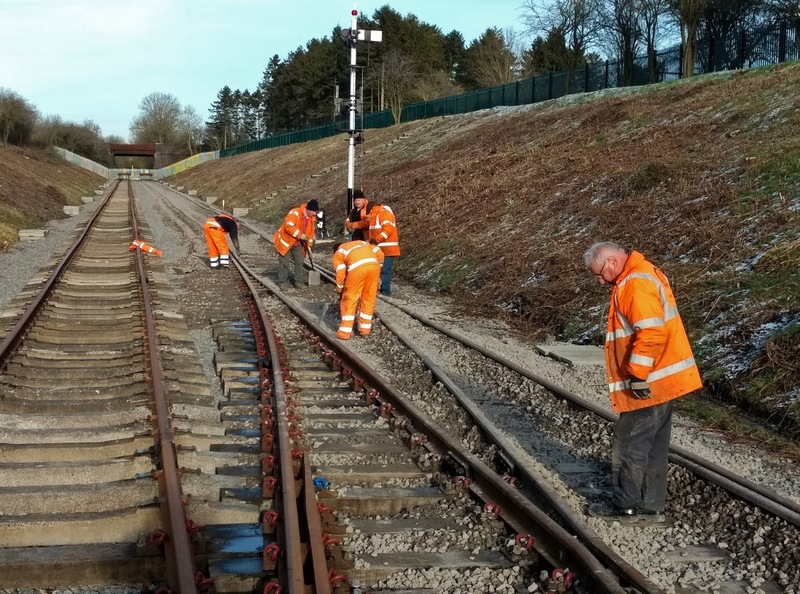 The tamping crew is coming on Feb 20th. The old coaches are someone elses property so will be removed as is. The carriages are not owned by the railway. they are to be moved elsewhere. Very nice to see the 'Landie' in use on the rails again. As said above, the carriages in the sidings do look a little far gone. 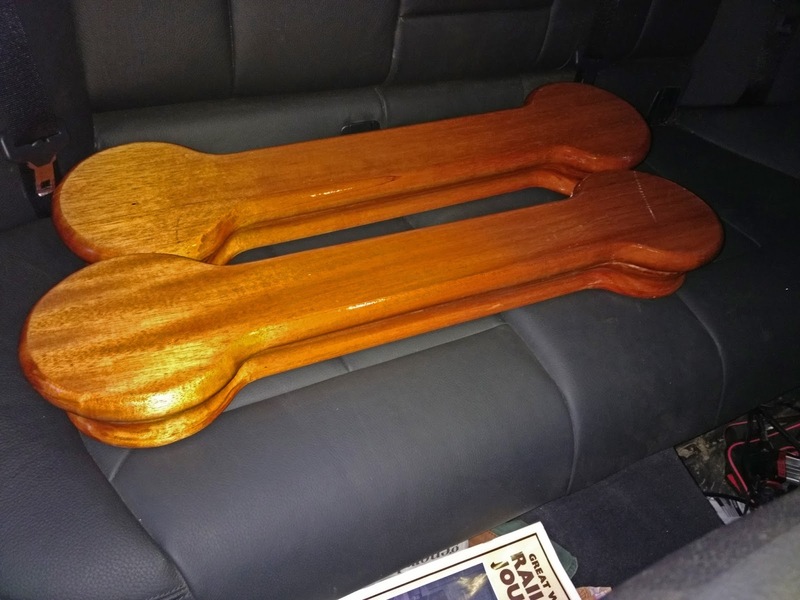 Surely they cannot be restored to anything except bolster wagons now. 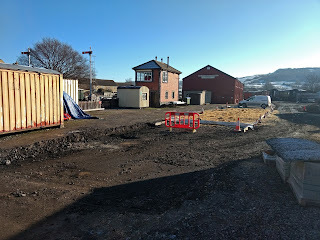 I imagine that Winchcome yard is being cleared for the construction of undercover carriage storage, am I right? If so, it is desperately needed. A well deserved pat on the back to you all for working outside in these sub-zero temperatures. The sinks do look rather nice at Broadway. - fit in nicely! My understanding - someone please correct me if I have it wrong - is that a carriage running shed will be built on the Malvern side at the Toddington end. The other side, where the ruined carriages are, is part of a larger Winchcombe plan in a second stage. 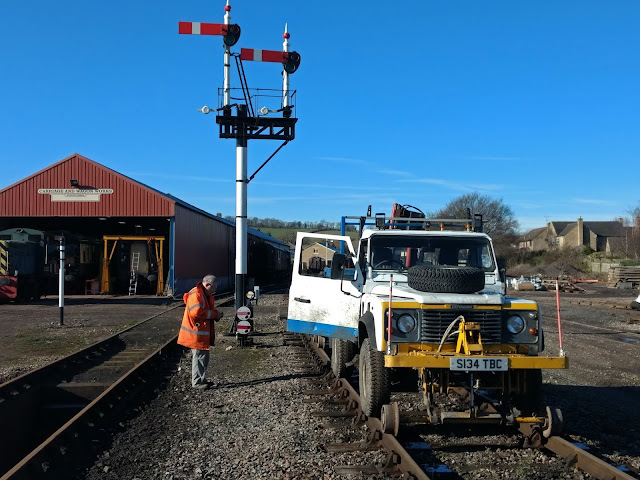 I hope the signalman gave you a token before you drove the landie to Broadway! 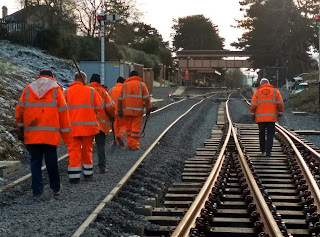 Movement in fact is very limited as the track is up at Toddington south. Well done to all for braving the cold weather to get things done. The sinks at Broadway really do look the part and will set the standard of the toilets well above the average offerings. 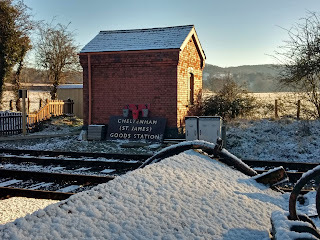 Is that the original hut for the acetylene gas production system for the station lighting that the goods station sign is leaning against. Are there any of the original fixtures and fittings still inside? 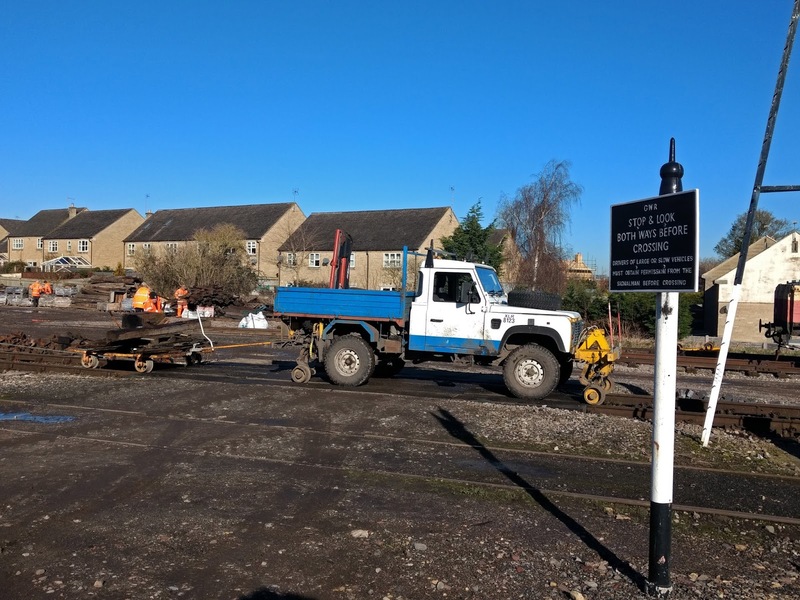 For the proposed carriage shed, will any of the existing track work be re-used or will concrete sleepers and flat bottom rail be brought in? I hope you have some warmer weather for the weekend. Any reason there are no hip irons on Toddington Signal Box roof? 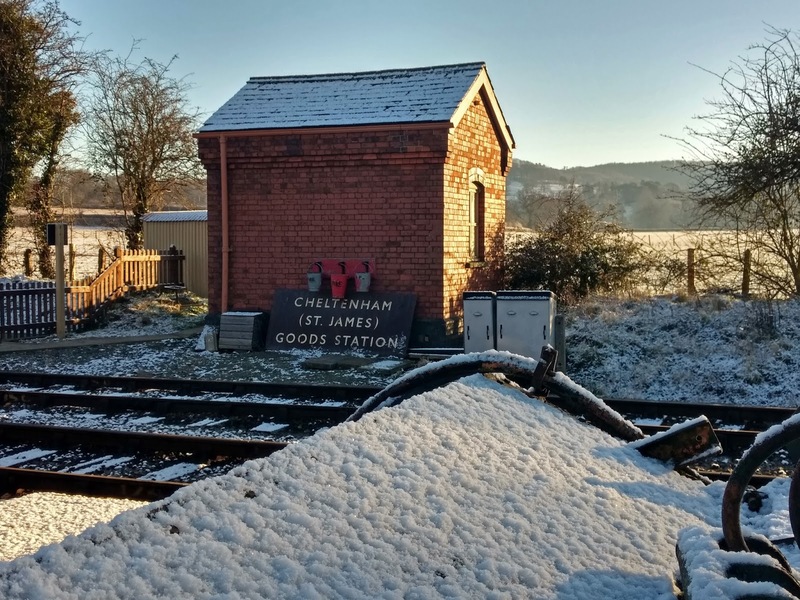 I thought there were previously, as at Winchcombe. The S&T department may be able to answer that one. I understand that one of the carcasses at Winchcombe is the remains of the first carriage that ran on the Llangollen Railway in preservation, and they wanted to get it back for restoration. By now it'll be a complete re-build from the sole bar up, but they are a capable bunch up there. What is certain is that the removal of both wrecks will be a vast improvement at Winchcombe, as they've been a dreadful eyesore for too long. Yes indeed. I know this isn't the C&W blog but a quick look at a heritage rolling stock data base identifies these 2 money pits as: 1- GWR 5539 a 5-compartment Brake 3rd built in 1928 (unique) & the Llangollen Rly's 1st coach. Purchased way back in 1967 for the SVR. 2- GWR 5500 brake 3rd built 1934 (unique) and purchased in a gutted condition by the Blaenarvon Rly. Both valuable GWR survivors but too late by far. The exam question being, would you throw money at either of them? The answer to that question is, inevitably, no. In any case, the Railway which Ted mentions simply doesn't have the funds. Sad, but there it is. Even sadder are the number of heritage railways who own rolling stock "awaiting restoration" with, let's be frank about it, no hope.